Last week, walking home from work, I looked up and spotted the silhouette of a man on one of the ledges of the Empire State Building. I did a double-take: It was really alarming! But I could see quickly that he wasn’t real. Had “he” always been there? Had I just never noticed this particular ardornment? There were more the following day. Once I started looking for them, they seemed to be everywhere–standing atop buildings across the skyline, poised as if about to jump. Their dark figures are at once completely disturbing and magnificent–kind of stunning. 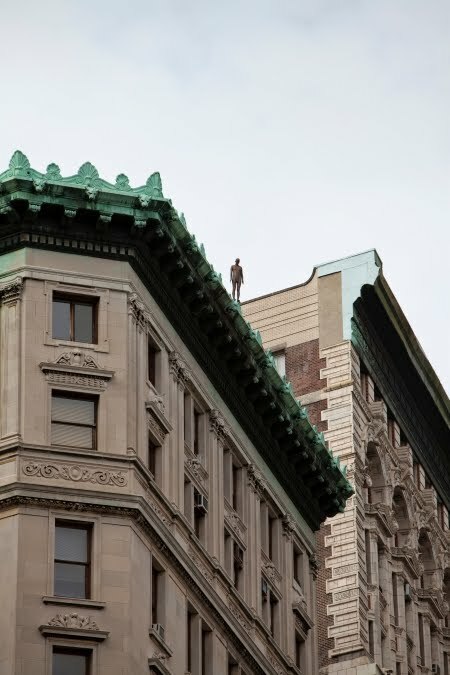 The exhibit is the Madison Square Park Conservancy’s latest show, Event Horizon, where thirty-one of Antony Gormley’s sculptures–life-size body forms–have been placed throughout the Flatiron district. They will be up through the summer.